Two blind dates--one was stood up and the other one wishes she was. Have they both been set up in more ways than one? After Mitchell Regan and Robynn Hartley broke off their engagement, they remained friends and continued attending the same church. They've attempted to keep their unhappiness a secret from each other and everyone else but they can't fool their close friends, Marina and Chad Anthony, who decide enough is enough. 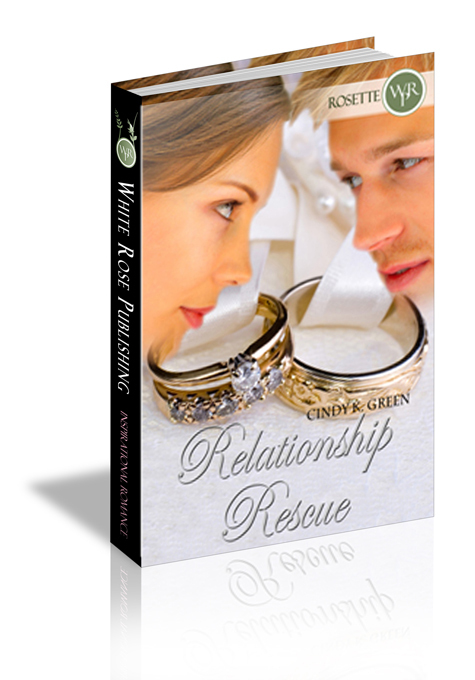 It's time for a Relationship Rescue. “Do you think he’s lonely,” Marina Anthony asked as they stepped out of the church building on a beautiful Sunday afternoon. The sky was a bright blue with fluffy white clouds scattered here and there. Birds were singing in nearby trees and the sun was gently warming. “Who, dear?” her husband, Chad, asked. He couldn’t help but smile at her. “Mitch,” she replied as they watched their friend, Mitchell Regan, climb into his old, green pick-up, the bright spring sun reflecting off his windshield. Chad laughed while he wrapped an arm around his wife’s shoulders. “You worrying about Mitch again?” His tone was playfully chiding. Mitch drove by them with a wave. Both husband and wife returned the wave with accompanying smiles. Her eyes lit up earnestly and her husband was reminded of why he loved his wife of ten years so very much. She gave him a satisfactory smile and they headed for the car. Chad knew his wife’s head was swimming with ideas of how to bring Mitch and Robynn back together. Robynn Hartley leaned back into the wall adjacent to the door leading into the Anthony’s café, Gimme a Latte. She dipped her head downward and drew in a deep breath before releasing it. Why is he here? Why tonight of all nights? It was just her luck to have returned from the worst blind date in the history of the world to now be faced with her ex-fiancé. Sneaking another peek, she could see Mitch Regan sipping a cup of coffee. Marina and Chad Anthony were behind the counter, chatting with another customer. The entire café seemed to be filled to the brim with patrons. Her eyes veered back to Mitch. The only available seat appeared to be next to him. He moved a hand through his short sandy-blonde hair as he sat back into the sofa, his eyes roving around the room. As she watched him, the overwhelming sadness she usually kept below the surface, came pouring over her. She realized how lonely he looked. Why hadn’t she noticed the appearance of those lines around his eyes before this moment? The familiar ache in her heart started up again. She backed away from the window and rested her head against the wall behind her. Oh, Lord, Why? It was the same question she’d been asking for six long months and she was still waiting to receive a satisfying answer. It was as if God didn’t think she was ready yet. Maybe there was some other lesson she was meant to learn in the larger scheme of things. Robynn raised her eyes to see a couple walking toward her, pushing a baby in a stroller. She recognized Anna and Nate Stephenson, frequent shoppers at her baby boutique, and their cute-as-a-button six-month-old daughter, Kelsey. “Oh, hey, Anna,” Robynn replied. She leaned down to the baby. “And how is my favorite customer.” She shook her head from side to side at the little girl with animation. “Hello, Kelsey. It’s nice to see you, Kelsey,” she said in a babyish tone. The baby’s face broke out into a large toothless grin and then she squealed with delight. “She’s always happy to see you, Robynn,” said Nate. “When are you finally going to get married and have a baby, Robynn?” asked Anna with a smile. It was annoying how often she was asked that question and how much it hurt to hear it now. But what did she expect as the owner of a baby shop. It was different when she was with Mitch. They’d made plans for a future—a life, a house, and children with God at the center of it all. Robynn only smiled in answer; it was easier than admitting she had no life. “Nate, look there. Isn’t that Mitchell Regan?” asked Anna. “Do you know, Mitch?” asked Robynn, a bit taken back. She tried to keep her voice reserved and even. Robynn closed her eyes for a split second as her insides twirled with pain. She loved kids and the one thing she’d always hoped for was a child of her own. Without realizing it, she had raised a hand to her stomach. “You know, Mitch, too?” said Nate. She didn’t need to be told that. Yes, Mitchell Regan was cute, standing six foot two in his bare feet with a natural tan which seemed to make his sandy-blonde hair glow, broad shoulders, a smile to make any girl melt, and those profound brown eyes—the eyes that could charm anyone into anything. Too bad I couldn’t charm him the same way. Anna and Nate said their goodbyes and entered Gimme a Latte. Robynn knew she should either go on in as she promised Marina or go home. This is what was so difficult—remaining in the same circle as Mitch, pretending to be his friend, made her heart ache and yet she couldn’t imagine severing any and all connection to him. Oh, Lord, guard my heart. Being friends with him has been harder than I ever imagined. Pushing the door open, she stepped inside. Well, her date this evening had been horrible already. Why not add awkward and embarrassing to the mix. Then it would be a perfect night.